cuts and bends a length of brass or nickel, by drawing through die on draw bench, fills the tube or trough thus formed by pouring in molten lead; draws again through die on draw bench; drills and taps screw holes, if necessary. a sheet metal worker q.v. who makes barrels for beams tor lace machines from tinplate or sheet metal, and fixes them to shaft: cf. beam turner (466). shapes, by beating over a block with hand or machine hammer, sheet aluminium or other metal into various shapes according to pattern, e.g.. , panels tor motor cars. cuts flat sheet of brass or copper to size and shape required, with hand or machine shears, and beats it out into shape for cornets, trumpets, etc., with a hammer on a mandrel; if bell is not all in one piece, brazes parts together, cf. brazer (262). (ii) a sheet metal worker q.v. who covers bobbin boards, pirn boards, and creel boards with sheet metal. a sheet metal worker q.v. who bends sheet metal to moulds and patterns of bonnets, by hand and mallet or by machine; solders wire to edge for stiffening purposes; also solders or rivets on hinges, handles, etc. assembles cylinders and beads oi Kens or arums and fits iron hoops, using hand hammer; closes seams round top and bottom edges by passing between vertical revolving wheels of seaming machine. bends brass sheet metal into cylindrical form, brazes joint, turns edges over wire, and smooths them with a small wheel machine called a jenny. puts together stamped, flyed, or hand cut parts of canisters or tin boxes, and solders joints to make them watertight; usually works on tin boxes of large type and specifically designated according to kind of article, e.g., grocer's canister maker, tea canister maker. rolls into form, and rivets or solders, stamped parts of cans; sometimes specifically designated, e.g., beer can maker, milk can maker, oil can maker, roving can maker, sliver can maker, water can maker. a tinsmith q.v. who makes, or builds up, "tin roller" or tinplate sections of rollers for carriage of a mule spinning machine. a tinplate worker q.v. who makes cases for gas or water meters. a sheet metal worker q.v. who makes cisterns from sheet metal; cuts sheets in shearing machine, bends them in bending machine, drills or punches holes for rivets; rivets sides to strengthen corners with riveting machine, see machine riveter (265). a tinsmith q.v. who specialises in making coffee pots and similar utensils. (iii) stamping and pressing them from sheet metal; cf. press hand, stamper (264). cute blanks from sheet brass or other metal under guillotine or power shears; sometimes specifically designated, e.g. zinc cutter. cuts and shapes by machine, sheet steel panels for railway carriage doors, sides, etc. ; measures and marks sheet for cutting; places sheet under knife of power-driven cutting machine; passes sheets between rollers of shaping machine; marks out and drills or punches holes for screws in drilling machine. a sheet metal worker q.v. who makes ends of cylinders (other than those which are cast) used in textile machinery. spins and turns sheet metal on lathe to form commoner varieties of cymbals, drills out hole in centre. a sheet metal worker q.v. who cuts out, rolls, bends, and shapes tin or zinc plate and so makes utensils, for use in dairies, etc., by riveting and soldering with cast parts, e.g., pail bases, handles. 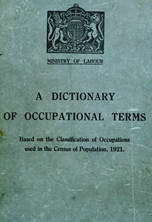 (ii) (where work is sectionalised) general terms for semiskilled workers engaged on drum and keg making, including cutter, folder (279), roller (279), groover (279), press hand (254), boxer-up, dipper (279), necker (262), tryer (278) q.v. a sheet metal worker q.v. making internal fittings of safe throughout, e.g., drawers, cupboards, shelves; may also fit drawers, etc., in place in safe. a sheet metal worker q.v. who can work both in iron plate and tin plate. cuts and drills, or bends into shape, with machine shears, drills, bending machine, punches, and rollers, thick ironplate for boilers, ovens, floors, walls, etc. ; for workers in thin metal plate, see sheet metal worker. a tinplate worker q.v. who assembles, by riveting, seaming, or soldering, various stamped, spun, and pressed metal parts to make a kettle. a sheet metal worker q.v. who assembles and solders together component parts of motor, cycle, carriage, etc., lamps; sometimes specifically designated according to kind of lamp made, e.g., carriage lamp maker, cycle lamp maker, motor car lamp maker. cuts sheet tin, zinc or lead to fit, as lining for wood or metal boxes, by means of treadle guillotine or hand shears; joins sides by soldering, and drops lining into box or case; turns flange over top edges of box or case; sometimes also solders on lid of tin or zinc, when box is packed. a tinplate worker q.v. engaged in making bodies of gas meters; sometimes specifically designated, e.g., wet gas meter maker. a gas meter maker q.v. engaged in repairing bodies of meters; repair of recording and checking mechanism is done by gas fitter (285) q.v. makes pots, dishes and other vessels from sheet pewter (mixture of tin and lead, tin predominating), by the processes of a sheet metal worker q.v. ; may also shape pewter articles by spinning on a lathe; may fix pewter trays and spirit pipes in a public house. a sheet metal worker q.v. who makes air shafts from sheet iron or steel, by bending it into circular, square, or other cross-sectional form, and riveting seams; erects section of pipe in position and joins it to sections of pipe shaft already erected by riveting. (ii) rounds flat metal on a mandrel, and solders edges and other parts together. operates high-speed, power-driven, planishing hammer, which removes all dents, creases, and irregularities, polishes and puts fine finish on metal articles; turns metal about on table of machine as necessary; also, with hammer or wheel, perforates, raises, presses, bevels, mitres, and performs other similar operations in sheet metal. cuts out metal plate with hand shears; moulds on sole-moulding machine grinds edge on emery wheel; fits to bottom of last with nails or screws. cuts, bends, and rivets by hand, or stamps out under a power press, pans and scoops for counter scales; bends and solders edge over wire for rim strengthening purposes. a sheet metal worker q.v. cutting and preparing steel or zinc sheets for use in covering boiler clothing. a sheet iron worker q.v. who shapes pipes, ducts, etc., with hand tools on an anvil; welds and rivets seams and joints. general term for a skilled craftsman who works in thin sheet metal, i.e., zinc, tinplate, galvanised iron; marks out metal from template or dimensioned sketch and cuts it by hand or power shears, or treadle guillotine; shapes it, by hand with hammer, mallet and forming blocks or anvil, or by pressing in pressing or stamping machine, see pressman (254); sometimes shapes by passing sheet between appropriately shaped power-driven rollers or by bending in bending machine; makes joints by various methods according to article produced; may bend and bind edges of seam in seaming machine, or rivet overlapped joint by first drilling or punching holes in drilling or punching machine and then riveting in riveting machine or by hand with hammer; may weld or solder joint, see welder (190) and (249) or solderer (262); attaches handles and other cast or machined fittings by riveting, soldering, etc., to make required articles, e.g., domestic and culinary utensils, motor body parts; for worker in thick sheet metal, see iron plate worker. a sheet metal worker q.v. working on sheet metal work of carriages, etc. a sheet metal worker q.v. making spouts of sheet iron for conveying cement into bins in warehouse; cf. spout maker (474). a tinplate worker q.v. who makes up from tinplate or sheet tin, articles of hollowware, e.g., water cans, coffee pots, teapots, kettles, cooking utensils. (ii) a tinsmith q.v. on board ship. a tinker q.v. who specialises in work on and repair of brass and copper articles. a sheet metal worker q.v. who works in tinplate, i.e. sheet steel coated with tin, cutting, rolling, raising, hollowing, and shaping tinplate, and closing rims, soldering, seaming, or riveting joints of articles, e.g., domestic utensils, and cans for food preserving. a sheet metal worker q.v. cutting, bending, soldering, or riveting metal trays. a sheet metal worker or a tinplate worker q.v. making travelling trunks from sheet iron, or tinplate, by cutting, shaping, riveting, etc. ; fits hinges, locks, and other fittings. cuts flat sheet of brass or copper into strips of required size and shape; forms them into a straight or tapered tube by lapping metal strip over a steel mandrel, and joining seams with spelter solder. a sheet metal worker q.v. who- assembfl.es spun, pressed, and turned metal parts of an urn, by riveting, soldering, or brazing; works in copper, brass, or tinplate; for copper urns made by hand planishing, see coppersmith (227). a planisher q.v. using a machine in which component parts of sheet brass articles are planished or trued upon a wheel in a lathe. a jobbing tinsmith q.v. working for an ironmonger (770) on repairs to plated sheet metal and hollow-ware goods. a sheet metal worker q.v. who specialises in making wing parts of motor bodies, such as mudguards. as for tinplate worker, making zinc goods such as trays, guttering, ridges, pails, etc.